idols, YUVA, an NGO in Panjim, has constantly stunned the crowds with their innovative, out-of-the-box ideas and record-breaking Ganesh idols. While the NGO is known across Goa for their active contribution in the social sector and winning multiple awards for the same, they are even more famous for their jaw-dropping Ganesh Dekhavas. In fact, for many, they have become synonymous with the festive spirit and their location in the heritage locality of Fonte Phoenix (Mala Zar), Fontainhas is a popular attraction during the Ganesh period. “We have been using different materials to depict Lord Ganesha for every Ganesh Dekhava we’ve done since the last five years. Our aim is that as Chaturthi is a cultural festival and celebrated all around Goa, we as YUVA want to cherish it, bring about new concepts and basically just the community together,” says Aakash Khaunte, President of YUVA. In 2015, they made a Ganesh idol sitting on a swing. It was made of coir and sawdust, operated by a mobile app. In 2016, they made another idol out of 30,000 match sticks, which was standing on a lotus and rotated on the shadow of the viewer. In 2017, they made a Ganesh idol that was not only 15 feet tall but also made of paper quilling and moreover, using infra-red technology, it could get up from its seat and bless the viewer praying in front of it. Naturally, curiosity arose about what this group would do this year and before they got into the job of deciding what’s next, Café asked the founder of YUVA and the recipient of Goa State Youth Award, Raghuvir Mahale, if this year’s idol was aimed at breaking any records. He smiled and said that their focus is always only on winning the hearts of the public. And the response every year has been tremendous. There’s a buzz around the launch of the Dekhava on Ganesh Chaturthi, September 13 at 7:30 pm at the hands of CCP Mayor Vithal Chopdekar. “We are very happy with the response we get every year. This is the main source of energy for us to do something new,” says Raghuvir. 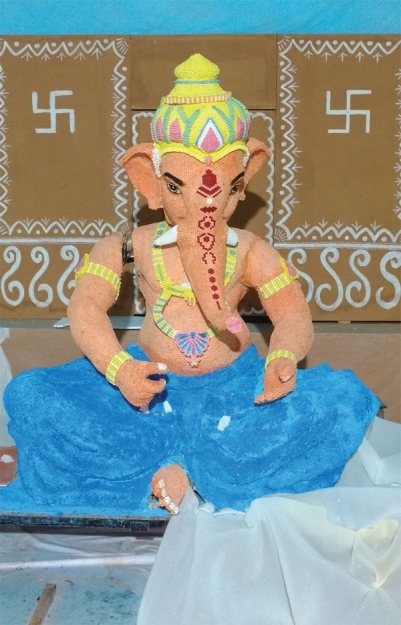 And it is safe to say that they have managed to continue if not improve on their own trend and this year, YUVA has been working on a Ganesh idol made entirely out of chalk. “We planned to do the Ganesh of made up chalks because we wanted to strike a resemblance between Ganesha writing and the chalks (as it is used as a material of writing). The concept has been visualised by Ankita Mahale and nurtured by everyone’s hard work,” says the team, while speaking to Café as they were putting on final touches to the Dekhava. The team consists of Raghuvir Mahale, Ankita Mahale, Akhil Prabhu Verlekar, Anirudh Madkaikar, Sarvesh Shetye, Ravish Shetye, Radiya Mahale, Manjit Pednekar, Maitheli Pednekar, Shaileja Chopdekar, Diksha Shetye, Shashank Sukhthankar, Pranav Prabhu Parrikar, Sainath Uskaikar, Amey Shanbhag, Preetesh Kerkar, Achut Mahale, Karan Dalvi, Varad Angle, Aishwarya Sinari, Gopinath Chandelkar, Granthali Bhingi, Ravi Kamat, Nandkishor Chopdekar, Ramkrishna Chopdekar, Tanisha Shetye and Shripat Mauzo. “It took us almost one month to complete the Ganesha as well as rats and the whole scene. We used to sit every day for three hours to cut the chalks. First we used to segregate the chalks and then soak them in water so they lost their wax and made it easier for us to cut without generating chalk dust. The chalks were cut in the shape of tablets (medicine) so we could stick them carefully on the Ganesh structure. We made approximately 10 pieces of 1 chalk (8cm),” adds Raghuvir. They sourced the material through the Kores Dustless Chalks. The pan-India company sponsored the chalks from Madhya Pradesh, which was sent to Pune Depot and transported to Goa. “We have been making Ganesh Dekhava since last five years and since the last three years, in Fonte Pheonix (Mala Zar). The reason behind selecting this place is that people can also get a chance to enter the heritage spring of Mala and admire the nature beauty of the underground tunnel as well as fresh water. Every year, we have celebrating the festival with an innovative touch i.e. mixture of art and technology. This year, we have Ganesh idol made up of chalks and Ganesha writes on a book which get printed on a paper slip with different social messages that the viewer can take away. The scene depicts the mythological scenario where Lord Ganesha wrote down the epic, Mahabharata, with is tusk, says Raghuvir. To explain how this works, the team demonstrated how the viewer can ring a bell, which leads to the movement by the Ganesha idol for representation that is meant to illustrate the Ganesha idol doing the action of writing. Using a printing machinery connected to the idol, as it moves, social messages like ‘wear helmet’, ‘don’t litter’, etc are printed on paper slips that can be torn away and taken by the viewer. “The main attraction of this year is Lord Ganesh giving you social messages which you can carry home and implement it in your daily life. Secondly, we have one rat (mushak) swimming in the water continuously,” adds the team members. “We have even made a customised Marathi song for Lord Ganesha, written by Neha Vaze and sung by Rajesh Madgaonkar and Sneha Nagarsenkar. The song has been composed and recorded by Sindhuraj Kamat,” says Aakash on a concluding note.